You're right, it would be strange that if the igniter is completely burnt out and the bike continued to produce a spark. My understanding was that igniters could gradually degrade, and at a certain point it would impede proper spark timing, but I very well could be wrong. I wouldn't mind having a points set up, actually. Gives me more things that I could fix with adjustment than replacing modules. Would it make sense economically to convert to points instead of just replacing the igniter (if that is indeed the problem)? What components would I need to find in order to make that conversion? Also, I have a used igniter in the mail from eBay, so I'll keep you all updated on how it goes. Thanks for the input! They can fail gradually but it is super rare. I've only seen it in units I was purposely stressing to failure. Are you testing for spark in the actual spark gap at the plugs, or are you testing somewhere else in the path while the plugs are installed? I would try new plugs since they are cheap. The double spark is something to look into. That should not be happening and might indicate the timing is way off. Can you post a very good photo of the pickup area in case something is amiss there? 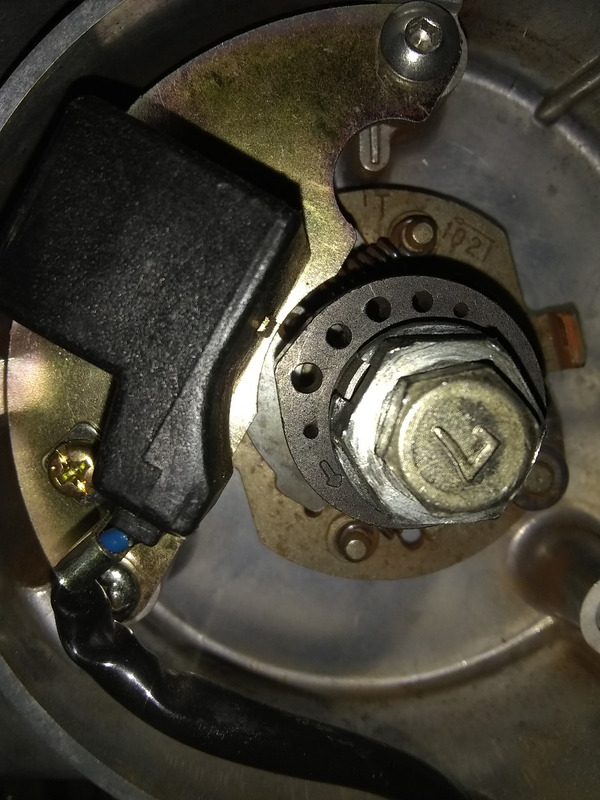 To test the spark plugs, I take one of the plugs out, reconnect it to the wire, ground it to the engine, and crank the engine while looking at the plug for spark. I'll go ahead and get my hands on some new spark plugs, since it can't hurt. Here are some pictures of the timing assembly. It looks pretty close imo, but do you see anything I don't? Jaytraeg wrote: To test the spark plugs, I take one of the plugs out, reconnect it to the wire, ground it to the engine, and crank the engine while looking at the plug for spark. I'll go ahead and get my hands on some new spark plugs, since it can't hurt. I don't see anything major wrong with it. The gap between the rotor and the pickup seems a bit bigger than normal, but that could be the camera lens. It appears to me that the rotor might be a bit retarded from spec, but without seeing the f mark lined up perfectly it's hard to say, and it's certainly not far off enough to prevent starting. I assume you did not remove anything in that area so if it ran that way before, it should probably run that way again. Sorry the photo effort didn't pan out something more substantial. But it did make me still wonder about the double spark. One thing that could cause the double spark is the excessive gap in the rotor-to-pickup distance, but another could be the wrong polarity of the pickup wiring, or faulty wiring. When you did the engine work, did you remove the igniter or any associated wiring? Shoot, I was actually really hoping something was wrong there. The gap doesn't seem too large in person, probably only about a millimeter. I DID remove the igniter. 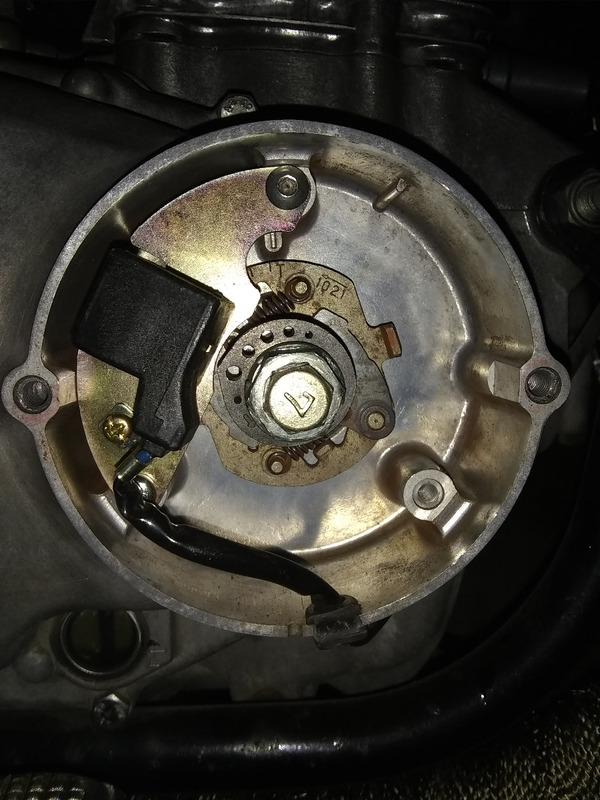 The repair manual says to remove the mounting bracket with the igniter and ignition coil before peeling the valve cover off. I just double checked the wiring harnesses (a 3-pin and a 2-pin), and they were both connected so the wire colors matched on both sides. How fast does the motor seem to be turning over when you try to start it? The speed of the crank can affect the spark. Also, if you remove both plugs and connect them back up to the wires, then lay them on the engine, can you raise one plug about 1/2" from the engine? That is, can you get a 1/2" spark out of it while cranking? consider jumpering to a car battery during your tests for increased endurance. Just be sure not to crank for more than 20 seconds at a time to avoid burning up the starter. Again, after rebuild, I had to kick over for far longer than I thought reasonable before it fired. Had a 1973 Kawi 175 F3 trail bike in the 80s. Thanks for all the advice folks, I really appreciate it. Great community here! Loudhvx: The engine spins at a good speed when I try to start it. It turned over just as fast and with the same noises as when the bike would actually start, so nothing seems amiss there. I'll give the 1/2" spark test a go after I charge up the battery. As for starting the bike from a car battery, I'm afraid I don't have access to a car at the moment. I'm away at college, so my resources are a little limited. 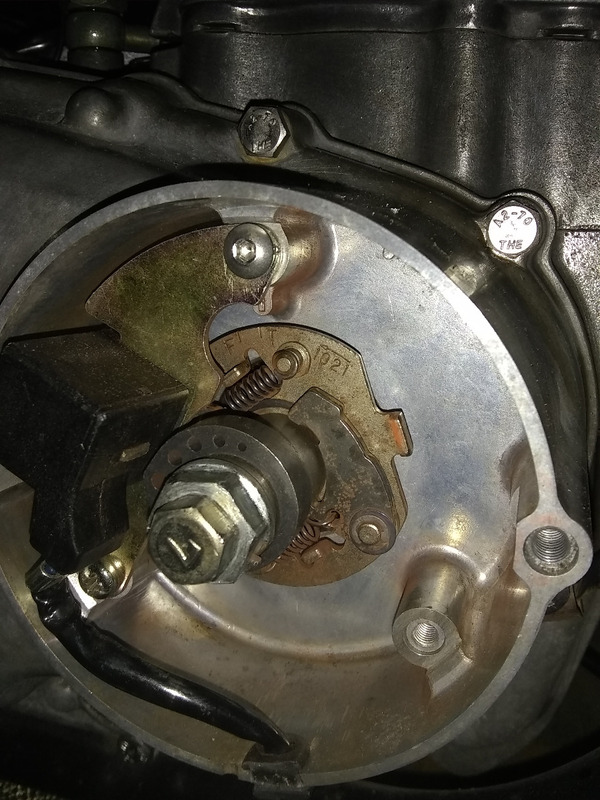 I've been making sure to take it (relatively) easy on the starter, because I'd hate to have that break on me on top of whatever problems I already have with the bike. One question I have is: what are ALL the things that could affect timing on the 440's? I'm convinced at this point that that must be it, because my spark is nice and juicy, I'm getting fuel and air, and have plenty of compression, while my sparking seems irregularly timed. I'd like to write out a list to completely check over to get my head straight on what it could be. Thanks again for all the help, folks. I'm not giving up quite yet! While waiting for the new igniter, I adjusted my valves (they were all pretty darn close to spec, but I wanted to make doubt sure), charged the battery, replaced the gasoline, and installed an on/off switch on my headlight to help save battery while cranking it. With a bit of starter fluid, it slowly began to cough to life. However, it was running pretty rough when I got it started. There was a loud tapping coming from the bottom half of the engine on the right side, and giving the bike throttle would make it bog. After letting it run for a little bit, like a switch, it started running really well. It responded very well to throttle, the engine suddenly sounded different, and that tapping noise was gone in an instant. THEN, a little later (not having shut the engine off), it reverted back to poor running and made the tapping again, like a switch. I checked the pipes, and both seemed to be getting warm at about the same rate. Thoughts? Also, I can't thank you guys enough for the help. It takes a village, right? That's great news that it at least runs. That suggests the igniter is probably ok. Sounds to me it's running on one cylinder for a while, then the second cylinder fires up for a bit. To rule out ignition, you want to figure out which cylinder is working and which isn't. Have you read about the water-spray test? That is the easiest, cheapest way, other than burning your fingers on the pipes (don't do that ). Once you know for sure which cylinder is firing and which isn't, then you swap plug wires and try again. If the same cylinder does not fire, then the problem is the spark plug or fuel. (Assuming the engine is good, compression, valves, etc..) If the good cylinder goes dead, then the coil or plug wires should be replaced. Alrighty, well the bike started to run worse and worse, to the point that it wouldn't idle anymore. It would still pop like it was trying, but it just wouldn't fire. Starting fluid did make it start, but would die as soon as it ran out of starting fluid. It seemed like no fuel was getting to the carbs, so I took them out and gave them a good soak in some Pinesol after reading about how long other people were doing that kind of soak, and went through the carbs with a thin wire to make sure every single passage was clear. 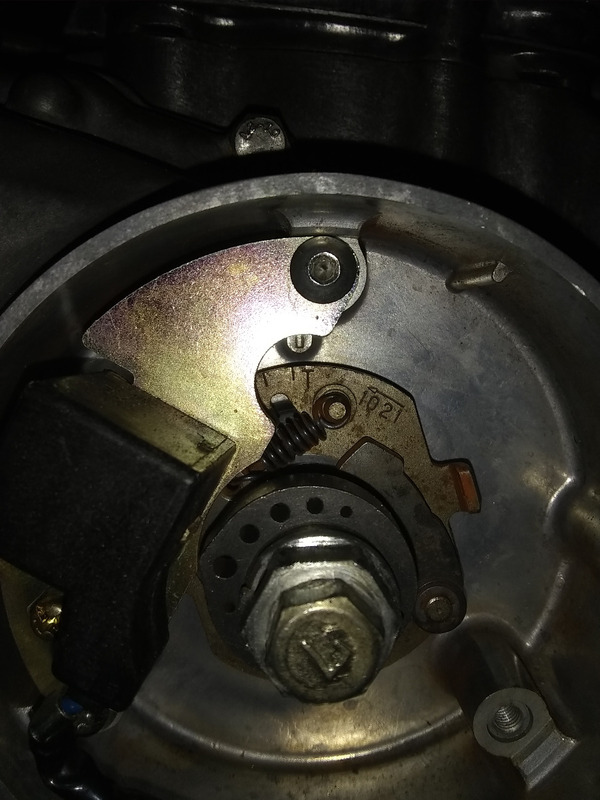 It was while I had the carbs apart that I began to question if I had set the idle air mixture screw correctly the first time around, and after looking around a bit realized it was way off (I set it about 3 turns out instead of 1.5). I reset that and the darn thing started up no problem and ran like a champ... for a while. Then it started choking out again! Luckily, I installed a clear fuel filter inline on the fuel line, and I noticed I wasn't getting very good fuel flow when the petcock was set to on instead of prime or reserve, so I suppose my reserve on the gas tank starts really early (I still had about a gallon of gas in the tank). It runs great now, though! I took it out for a nice 20 minute ride the other day and it works like a champ. I realize I'm rambling. TL;DR: The idle air mixture screws were set way wrong the first time I put it together, and I didn't have enough fuel to get adequate flow into the carbs. It runs! Thank you SO MUCH to everyone with input in this thread, I was really banging my head up against the wall on this. If nothing else, the engine got a lot of fine tuning and preventative maintenance that could have been a pain later on. You guys are the best.